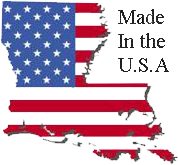 Preheat peanut oil in Cajun Fryer to 375 degrees. In the mean time, rinse and pat dry two game hens. Inject hens with about half a bottle of injectable marinade, putting lots of flavor in the breasts. 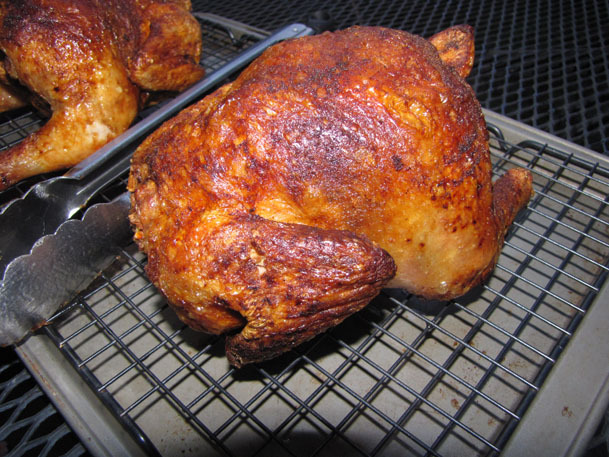 Rub each hen’s skin (remember to get both sides) with Tony Chachere’s Creole Seasoning. Once oil has reached proper temperature, carefully lower hens into fryer. We’ve done this by putting the hens in the fryer baskets and lowering them in as well as placing them side-by-side in the turkey basket. You may also want to rotate your hen during frying once with metal tongs. Fry hens for approximately 12 minutes, maintaining oil temperature. Shut off flame under fryer. Carefully remove hens from oil and allow to rest on a draining rack or tray (or just lift the baskets from the oil and prop up) for 5 minutes. Serve whole or cut in half with large, sharp knife. In a large mixing bowl, put onions, bell peppers, jalapenos, ½ bunch cilantro, ¼ cup olive oil, 1 Tbsp chili powder, 1 tsp cayenne, and 2 cloves garlic. Mix well. In medium mixing bowl, add beef, 1 clove garlic, ¼ bunch cilantro, 1 Tbsp olive oil, 1 tsp chili powder. Mix well. In separate mixing bowl, add shrimp, 1 clove garlic, ¼ bunch cilantro, 1 Tbsp olive oil, 1 tsp chili powder. Mix well. Wrap tortillas in aluminum foil. Preheat large sauté pan in grill over medium-high heat. Once surface is hot, add vegetable bowl contents to pan and cook for approximately 7 minutes, moving vegetables around frequently so they don’t burn. I like to use a metal spatula and a pair of spring-loaded tongs for this. Place foil-wrapped tortillas in a corner of cooking surface (flip every couple minutes to warm). After seven minutes, add beef, allowing to sear on hot surface for at least 2 minutes. After two minutes, begin mixing beef with vegetable mixture. Once beef has been on grill for four minutes, add shrimp. Sear shrimp for 1 minute before mixing in with vegetable and beef mixture. 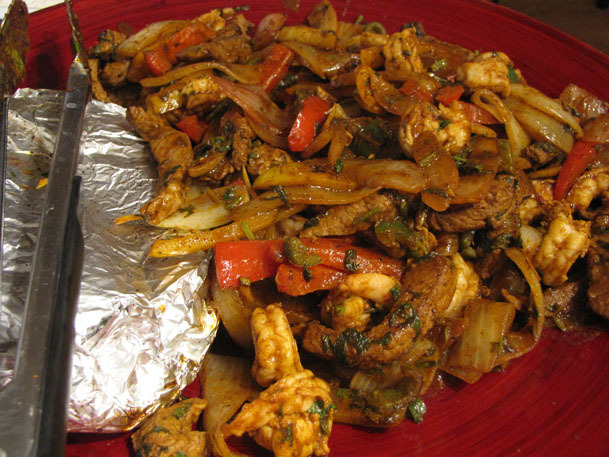 Mix entire fajita contents together and cook for 2-3 more minutes without overcooking shrimp. Remove vegetables, beef, and shrimp from surface and place on a serving platter. Remove tortillas and uncover. Serve fajitas with shredded cheese, salsa, and sour cream.